I guess sometimes, real life is very different from our romance novels. 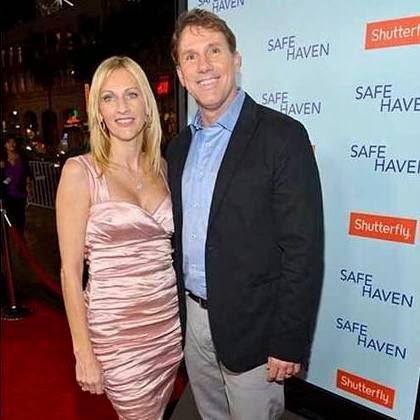 Author, Nicholas Sparks just announced his separation from wife of 25years! If this is proof that sometimes, there can be no happily ever afters, then I don't know what else is. The author, whose books have sold millions of copies and been made into movies, and his wife Cathy, who he said was the inspiration for his many heart-warming heroines, have come a long way, but it seems this is the end. 49 year old Nicholas Sparks confirmd the split Us Weekly. "Cathy and I have separated. This is of course not a decision we've made lightly. We remain close friends with deep respect for each other and love for our children. For our children's sake, we regard this as a private matter." The pair got married in 1989 and five children — sons Miles, Ryan, and Landon, and twin girls Lexie and Savannah. Some of Nicholas Sparks' most popular books include The Notebook, The Best of Me, Safe Haven, The Last Song, and A Walk to Remember. He said he first met his wife during spring break in his senior year at Notre Dame. In an interview with GQ last October, Sparks recalled how he met Cathy on a Monday. By Tuesday, he told her: "I will marry you." The two then exchanged passionate love letters. "Between March, when we met, and May, when we graduated, I don't know, a hundred love letters? A hundred and fifty?" In a 2013 interview with HuffPost Live, Sparks told the site that his wife served as the inspiration for many of the female characters in his stories. "I married a woman who loves a lot. Certainly every female character I've ever crafted is a lot like my wife. They're intelligent and loyal, they're funny. And most of all, they're not wishy-washy women. They're good, solid women." I wonder what has changed since then? Did she change, or did he? Who doesn't want to live with a loving, intelligent, loyal, funny and solid woman? Dare we hope they'll work it out and come back together? The devil is really out to destroy the foundation of children which is mainly a solid and loving home. May God help us . I pray they will be able to sort out their differences.